The BRAVE support vessel is the latest addition to DCNS’s product portfolio. The concept was unveiled at the Euronaval 2010 show in Paris in late October, where it attracted considerable attention, presumably for the simple reason that underway replenishment is the key to naval logistic support. 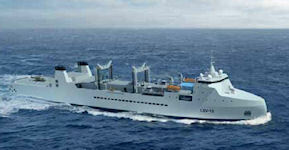 Speaking to international experts gathered in London on 9 and 10 December for the 2010 Afloat Support and Naval Logistics conference, DCNS gave a presentation on its new-generation BRAVE (Bâtiment RAVitailleur d’Escadre) underway replenishment tanker and support vessel under development for both the French Navy and international customers. By increasing export sales, the Group hopes to increase revenues by 50 to 100% over the next ten years. 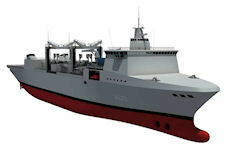 The multi-purpose BRAVE concept covers caters for missions currently performed by up to three types of French Navy ships. 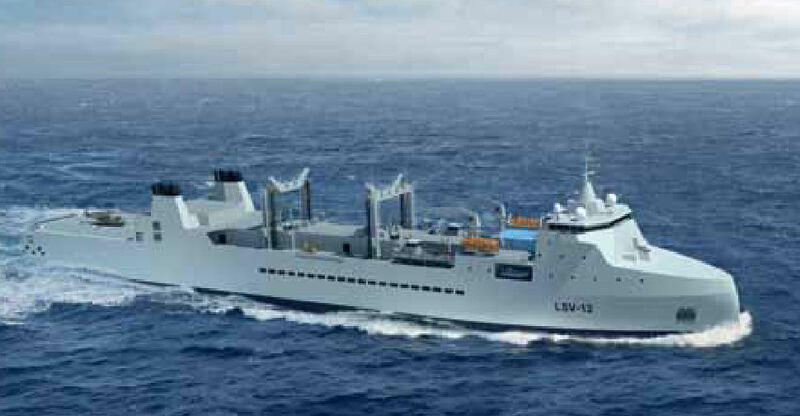 These include the underway replenishment of dry goods, munitions and fuels along with at-sea maintenance and repairs. According to DCNS studies, four BRAVE vessels would enable the French Navy to reduce its support fleet and crews by 50% while increasing total payload by 30% and cutting operating costs. The BRAVE concept has been designed from the outset with international customers in mind. The basic design can be adapted to yield versions with a length overall ranging from 165 to 195 metres. Shipboard volumes and areas can also be readily tailored to increase tank capacities or accommodate a naval force command team, troops and equipment or additional hospital beds for humanitarian missions. All navies need to get heavier payloads to distant locations more quickly while reducing the risks associated with underway replenishment. This is precisely the reason the BRAVE design features two mixed rigs, each designed to handle both fuels and dry cargo. In recent decades, DCNS has designed and built a dozen support vessels for the French Navy as well as the Navy of the Argentine Republic, the Royal Australian Navy and the Royal Saudi Naval Forces. Most of these vessels are still in service. aft zone with storage space for dry cargo and munit ions as well as workshops and, depending on the customer’s requirements, a vehicle storage area. 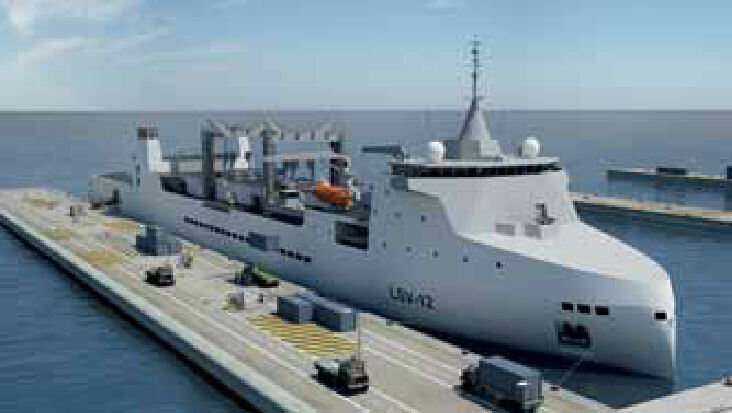 BRAVE support vessels are ideal for the underway replenishment of all types of products (dry cargo, fuel & other liquids and munitions), to provide logistic support for nav al forces and to store and deliver all types of pay loads, including dangerous substances. The BRAVE design complies with the latest standards and regulations applicable to tankers, most import antly MARPOL. The fuel tank zone is of a double-hull design. The deck architecture is optimised to facilitate ca rgo handling during both loading and underway reple nishment (UNREP) whether via the rigs when connected to a receiving ship (CONREP) or using helicopters (VERTREP). 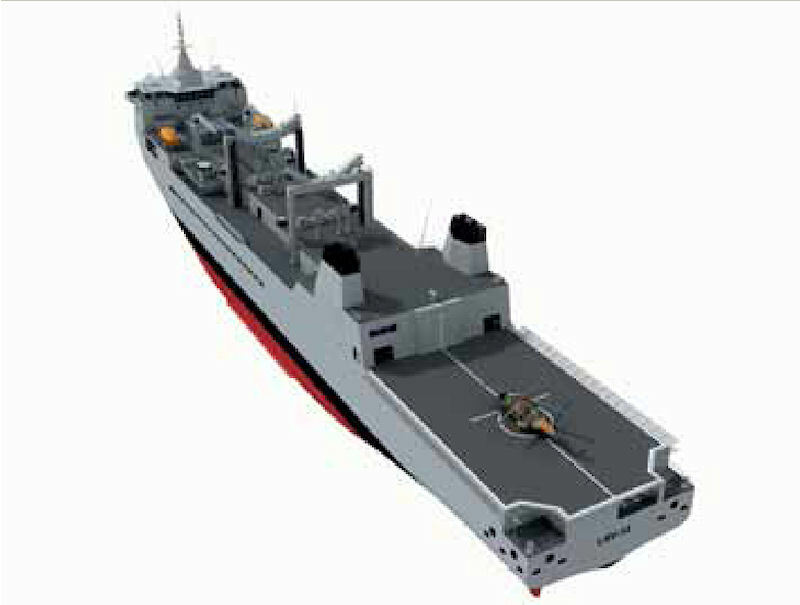 To en sure that the basic design can be readily tailored to a range of payload and replenishment needs, the midship zone can be ‘jumboised’ by adding one or two hull sections. The aft zone can also accommodate various additional and optional modules (hospital extensions, shelters, etc.) for specific missions. 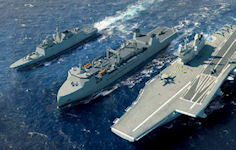 Many navies seek the capability to transfer bigger payloads more quickly. BRAVE ships can be equipped with one or two rigs, each handling both fuel and dry cargo. A BRAVE vessel with two rigs and two helicopter spots can thus transfer four dry cargo loads at a time. Development and construction with STX France like the LHD Mistral class and with convenient use of off-the-shelf product. From 8,000 to 16,000 m3 of fuel divided into 6 or 9 tanks. 1,500 m3 of drinking water in 2 tanks. 2,000 t of provisions, medical supplies, spare parts and 30 TEU containers in 2,700 m2 of hold space. 300 t of ammunition (torpedoes, missiles, shells) in 700 m2 divided into 4 holds. 100 passengers and modular hospital with 30 to 60 beds. 2 transfer rigs (fuel only) forward, port and starboard. 2 dual purpose transfer rigs aft, port and starboard. VERTREP, 1 spot for a heavy-lift helicopter (35 t).